Although well known and with a following in the Greater Newark (New Jersey) Area, as North New Jersey natives, Asher (alto sax) and Alex (tenor sax) are still in their early twenties. They started their careers by playing in the late lamented Tuesday jam session at the old Peppermint Lounge in Orange, and have appeared in such venues as New Jersey PAC (Performing Arts Center- including the "Absolut Sounds of the City " Summer Festival), Kavehaz (Manhattan), the Carlyle Hotel (Manhattan), the South Orange "Giants of Jazz", Cecil's Place (West Orange), Shanghai Jazz (Madison), the Crossroads (Garwood), Trumpet's (Montclair), Bula (Newton) and the Priory's (Newark) Friday night Jazz Series. 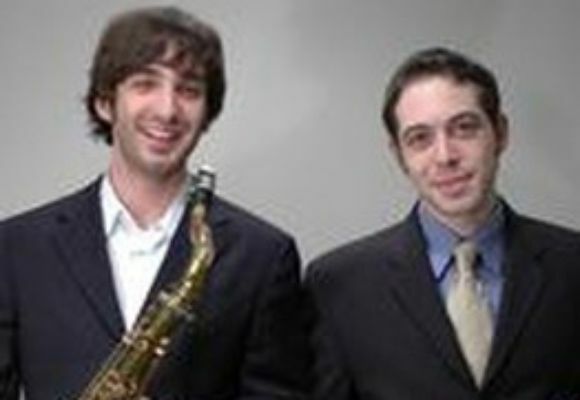 Each Alex and Asher graduated with majors in Jazz Studies from the University of North Carolina at Chapel Hill. Both me were awarded Burch Fellowships to study jazz- Asher studied Latin and Caribbean Music in Cuba in 2003 and Alex studied with top musicians and grammy award winning arranger Slide Hampton during the summer of 2002. Alex and Asher are leaders of their own quintet, are members of the Bud Powell Tribute Sextet and frequently appear as members of the T.S. Monk Sextet.
" . . . . they . . . display an impressive command of, and keen intuition for [bebop's] language [and] are capable of crafting solos and compositions packed with the kind of winsome lines and propulsive rhythms that make listeners pat their feet and nod their heads in appreciation."